This Gryphon product provides an entirely new category of tool for the glass artist. With a large grinding belt, offering a huge 90 square inches of grinding surface, you can now accurately grind straight lines or true up large curved surfaces quickly and easily. A small platform helps steady your work and tilts for easy beveling. 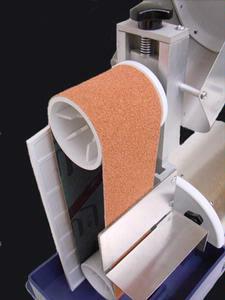 A variety of belts are available from coarse for fast grinding to ultra smooth for polishing.